I love Creme Brûlée, it’s all about the contrasting textures and tastes. The sound of the crack as you dip your spoon in to the silky custard you’ll find beneath the amber surface. But, and here’s a big BUT, you do need to take care. Add the warmed cream as slowly as you can in a steady stream whisking the whole time or you’ll end up with lumpy scrambled eggs. Also for an extra special Brûlée, spoon off the air bubbles from the surface before pouring your custard into the ramekins. Don’t be put off as once you’ve mastered these little beauties you will want to make them time and time again. Makes 6-8 depending on the size of your ramekins. 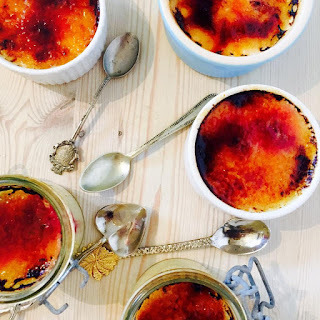 Just before serving sprinkle each Brûlée with a level tablespoon of caster sugar, run a blow touch over to melt the sugar or if you’re really careful and brave melt under a very hot grill, but don’t take your eye off of them for a second or the sugar will burn very quickly. Pop back in the fridge for 5-10 minutes until the caramel has set hard, then serve immediately. *TOPTIP It’s good to spray a mist of water on the Brûlées over the sugar before you start to caramelise them, this helps to stop them catching, giving a nice even finish. *TOPTIP Using frozen berries stops the fruit turning to mush when cooking.